The 2013 National Drug Control Strategy aims to serve as the nation's blueprint for reducing drug use and its consequences. This document includes strategies for the government to reduce drug use and strengthen community-based drug prevention efforts, empower healthcare workers to detect early signs of abuse, and reduce drug treatment stigmas. The Administration is focused on the goals of the Prescription Drug Abuse Prevention Plan as well as addressing overdose deaths, emerging issues like Neonatal Abstinence Syndrome, and increases in heroin use. There are signs that the national effort to reduce and prevent prescription drug abuse is working. In a break from past drug policy initiatives, the Obama administration sought to propose tangible reforms based on the science of addiction. This article from Popular Science describes the administration's efforts to research the neuroscience of addiction, supporting the notion that addiction is a disease that must be cured--not a moral failure. 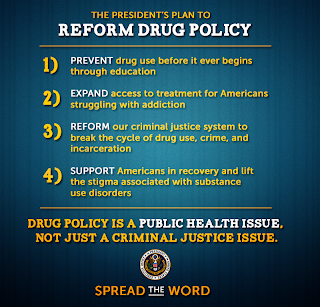 The 2013 National Drug Control Strategy also outlines a series of evidence-based reforms that treat the nation's drug problem as a public health issue, not simply a criminal justice issue.